A capacitor is a device which stores electrical charge – basically it stores electrons. In the most simple terms it can be thought of as being similar to a rechargeable battery in that it stores power to be used at a later time. Charging a capacitor is simply a matter or putting voltage across its legs until current stops flowing. Capacitors are an essential component in the majority of electronic circuits. There are many uses of capacitors in renewable energy projects. One of the most important is in smoothing the output from a bridge rectifier after it has converted AC electricity (typically generated by a wind or hydro turbine) into DC voltage which can be used to charge batteries or directly power many low voltage devices. They are also very important in power supplies and voltage regulators. If this direct current (DC) voltage output from the bridge rectifier is used directly to light an LED for example, it would flash on and off repeatedly. This is usually not considered to be desirable and there are many cases where a stable voltage is required. In these cases a smoothing capacitor is used. In the time it takes the output voltage from the bridge rectifier to drop from its maximum to zero and then rise back up again, the capacitor does not lose all its stored charge. Therefore the voltage measured across it stays near to the maximum voltage. The small dip in voltage and then bounce back up to the maximum again is the ripple. 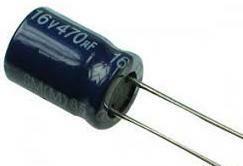 When a capacitor is used in this way it is also aptly called a reservoir capacitor. Capacitors are rated according to their maximum voltage and storage capacity (typically measured in micro Farads uF). The larger the capacity of a capacitor, the more charge it can store and the longer it will take to discharge. However, a very large capacitor will take a long time to charge initially and so it will take a while before a constant voltage is output. If the current drawn from the circuit is large, then the capacitor will discharge quickly and the amount of ripple in the voltage will increase. If the voltage in the circuit is above the rated voltage of the chosen capacitor, the capacitor will be damaged and may even explode. Therefore it is essential to choose a capacitor with a voltage in excess of the maximum voltage ever likely to be put across it. Typically in renewable energy applications a 1000 micro Farad (1000uF) capacity smoothing capacitor is chosen. These are available with a range of voltage ratings including 10V (pictured above), 16V, 25V, 35V, 63V with higher voltage capacitors costing more than those with lower voltage ratings. If the amount of ripple in the voltage is more than 10% then a capacitor with a higher value – e.g. 2,200 micro Farads – should be used. 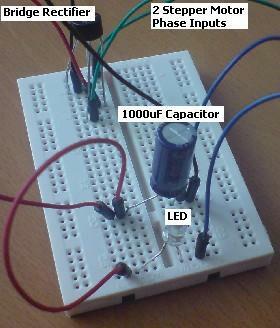 At the top of this page is pictured a very simple circuit on prototyping breadboard including a smoothing capacitor. Two AC inputs from a small stepper motor wind turbine are rectified by a W005 1.5A bridge recifier into DC voltage to light an LED. Without a smoothing capacitor the LED would flashed on and off, so a 1000uF capacitor was used to supply a stable voltage to the LED. Rectifier Filtering Smooth Capacitor Circuits – a guide to capacitor smoothing, and calculations for selecting capacitors to minimise ripple voltage and ripple current. An Introduction to Capacitors – an ‘introduction’ which goes into a lot of mathematical and technical detail. Understand Capacitor Markings – very useful if you salvage components from old electronics and want to identify the capacitors correctly.